Toronto, April 10: A Japanese F-35 stealth fighter jet has gone missing over the Pacific Ocean. The jet, which is one of the most advanced fighter jets in the world, was on a training sortie with three other F-35 jets on Tuesday evening when the jet disappeared from the radar and ground controllers could not establish radio contact with the pilot. The jet from Japan's Air Self-Defence Force was about 135 kilometers from the east coast of Aomori prefecture when officials lost contact, according to official broadcaster NHK. 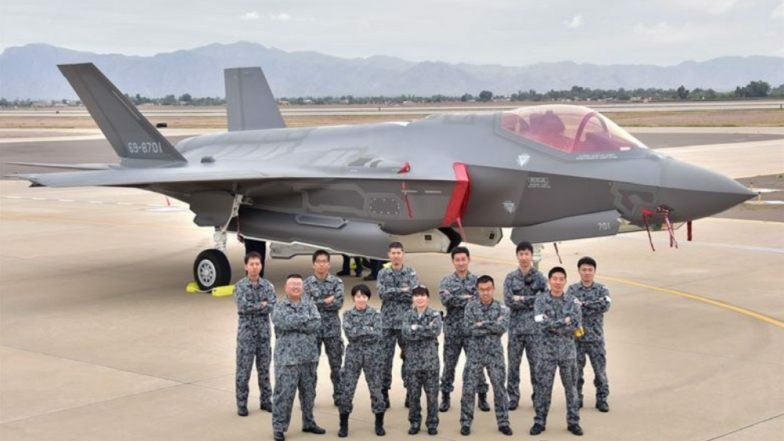 The NHK quoting Japan Air Self-Defence Force officials reported that the missing F-35A had taken off from nearby Misawa Air Base for a training mission at 7:00 p.m. local time. The JASDF’s radar lost track of the jet at 7:27 p.m. when it was about 135 km east of Misawa Air Base in the prefecture. Japan's first squadron comprising of 12 F-35A fighter jet model became operational on March 26, according to a report from The Diplomat.com. But Japanese Defence Minister Takeshi Iwaya said the JASDF will ground the remaining 11 F-35As for the time being. Asked about the cause of the incident, Iwaya declined to comment, saying they, “will put all our efforts to save the life (of the pilot) first.” Japanese officials do not have information with regards to whether the pilot managed to eject from the plane in case of a system failure. Japan is one of only 14 countries who are purchasing the F-35 jets, according to the plane's maker Lockheed Martin. Japan is scheduled to purchase 147 of the planes, making it the biggest customer for the aircraft besides the United States. JASDF will purchase 105 F-35A models which are conventional fighter aircrafts and 42 F-35Bs which are designed for short runway takeoff and vertical landings.